Newport, an abrupt inflection point. South Beach State Park is just south of the town and the ranger told us to drive by the site and if it was vacant we could move right in. Newport is larger than most coastal towns and we had planned to replenish here hoping for better selections and prices. First stop Fred Meyer grocery store and then the local liquor store (only beer & wine at Fred Meyer). Loaded up we head back to the State Park but not before Rose suggests a late lunch/dinner at Local Ocean Seafoods. Place was humming and we snagged two bar stools with a soothing view of the harbor. Feeling cavalier we selected a bottle of Bubbly Sauvignon Blanc from New Zealand to accompany the fish appetizers – Life is good! 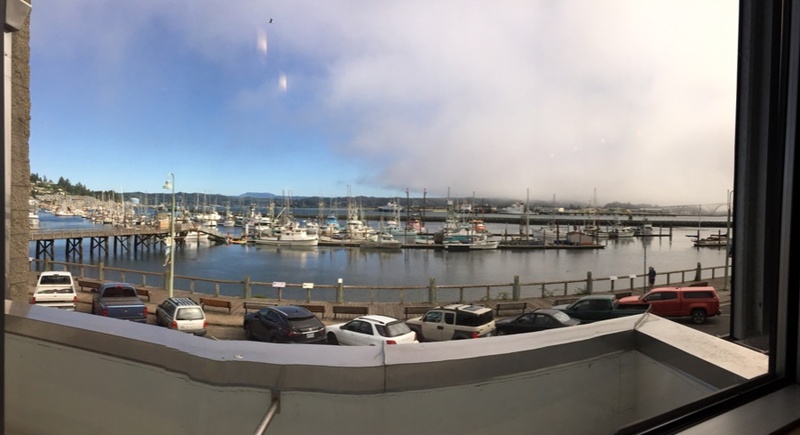 Harbor view from our bar stools. Sunday morning is the usual slow start along the coast and around 8:30 in the morning I am outside in the camp chair slowly enjoying my toast & jam and a cup of coffee. Out of the corner of my eye I sense Rose coming down the RV steps to join me and I wonder if she wants the chair I’m sitting in. In the next 1,000th of a second all hell breaks loose. A slip and a thud as she lands on the mat next to the steps and cry’s out in disbelief that she’s broken her wrist. I see that her arm and hand don’t seem geometrically right but also don’t want to believe what I see. “Stabilize the arm” flashes though my mind and I jump to help her into the chair I was just enjoying and placed her right arm on the arm rest and pleaded that she keep it there. She is in obvious 10+ pain but I know more needs to be done before heading for the local ER. A recently bought 14″ spatula will be the splint and a dishcloth the padding. Wrap her lower arm in it and find some Coban self adhesive tape to hold it all in place. She is still in pain as we head into town looking for the hospital, I know it’s there, and find a parking spot right next to the ER entrance. The staff see us entering and wave us right through to “document control”. Name, DOB and Insurance card is all that matters and we are in a room ready for action. 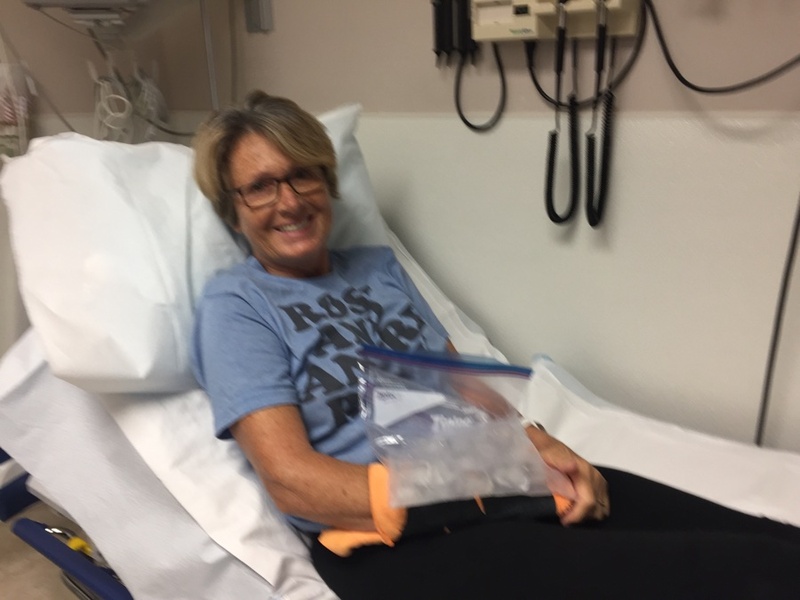 Rose, before any treatment in the ER. 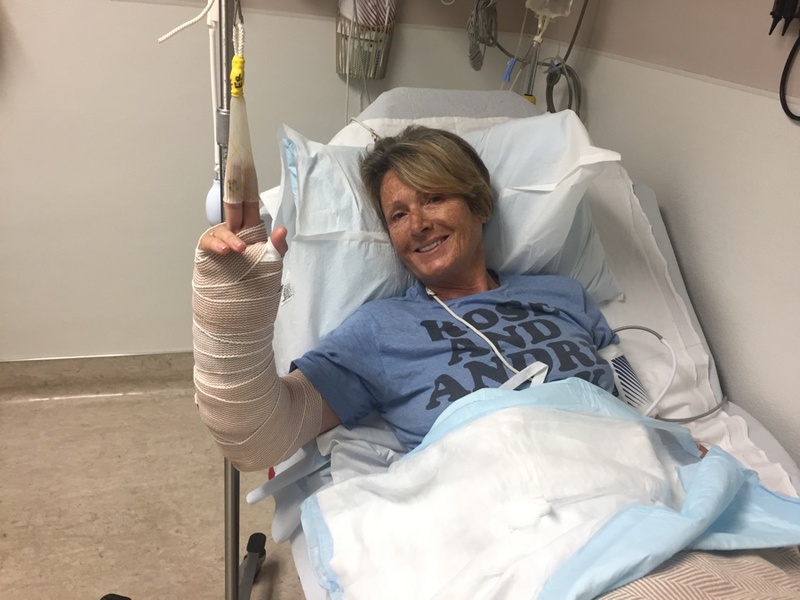 The ER staff were great. Dr Cook and nurse Isaac gave us all the attention we needed but it was still an ER room and their job is to stabilize you and refer you to a specialist. Hang by two fingers and wrap on the cast. Sent us on our way with some pain medications and instructions to see a specialist soon. Now the insurance Run in Circles starts. The ER referred us to an orthopedic doctor in neighboring Corvallis who promptly called us and said we can see you on Wednesday. We start calling around to see if our insurance will cover the visit which is out of state in Oregon but no one is willing to commit and there is always another 1-800 number to call. The Corvallis office calls again and lets it slip that the Dr has seen the X-Rays and that surgery is needed. That crosses a line and we know we have to get back to LA for further treatment. Rose gets an appointment for Friday and I search for a place to store the RV in Portland while we fly down. Nothing around the airport but we find Riverside RV park in Canby, about 30 miles south. OK, we’ll drive there on Tuesday, stay the night, leave the RV and drive the Subi to the airport and leave it there. Friday’s Update: Spent hours, LA style, waiting for Dr Benhaim at UCLA (where the insurance covers most things and Rose had previously seen Benhaim for a finger issue). Comes in and looks at the X-Rays which we had brought down with us on a CD . “You broke both the radius and the ulna”. Rose does not want surgery and asks what if I leave it as is. “There is a piece of bone here, here & here”. Do I need surgery? “It’s mess in there” he replies and that seals the deal. We are now in the “surgery phase” scheduled for Monday 31st. We now quietly wait, not wanting to put Mondays appointment at risk. Our plan is, fingers crossed for a good surgery outcome, to start some physiotherapy down here and head back to Portland around the 9th to 13th to get back on track for our Great American Eclipse experience at the Cove Palisades State Park where we have a prime campsite smack-bang in the middle of the Path of Totality. 7 Comments on Newport, an abrupt inflection point.